Columbia Pictures Royal flush: Sean Penn in the dreadful remake of "All the King's Men." In this season of great expectations and diminished achievements, the remake of All the King's Men may surpass The Black Dahlia as the most disappointing work of them all. In adapting Robert Penn Warren's well-known novel and updating the original movie, the new film purportedly suggests some contemporary connection to the Hurricane Katrina disaster and the revelations of the dishonesty and incompetence of the present administration. Whether intentional or not, those aspirations to relevance hardly justify the comprehensive clumsiness of just about every element of the picture. 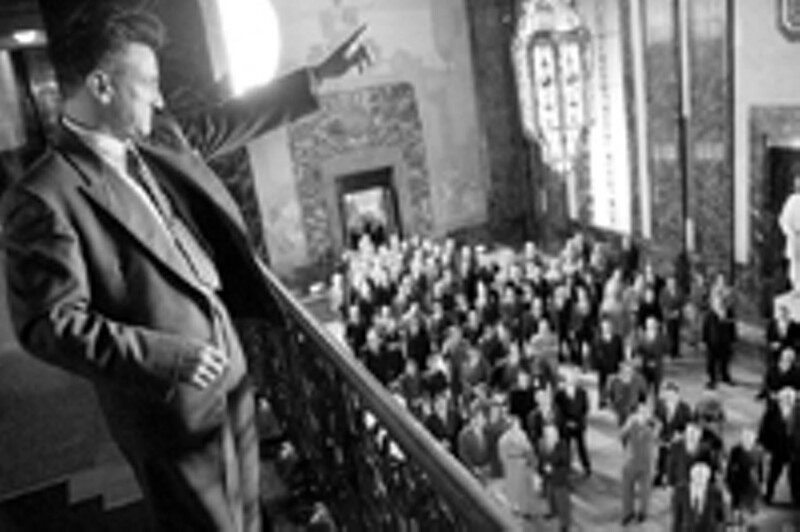 The story of the rise and fall of a populist demagogue, Willie Stark (Sean Penn), a character based on the legendary Huey Long, follows a familiar trajectory and supports the usual pieties about the corrupting effects of power. Stark begins his political career as an honest municipal treasurer in some Louisiana hamlet who tries to warn the citizens about the local politicians' crooked construction contracts. When an accident at a new school kills three children, he becomes something of a hero and attracts the attention of both the press and the political wheeler-dealers, who run him for governor, intending to use him as a wedge to split what the film's narrator, the reporter Jack Burden (Jude Law), calls "the cracker vote." When he learns of the manipulation, Willie strikes out on his own, delivering a rousing stump speech, speaking at county fairs, in swamps and bayous, to farmers, shrimpers, factory workers, and, yes, crackers all over the state. He wins the election, of course, but apparently --- one must guess at this, since the movie practices a weird reticence about almost everything ---suffers from his own fatal hubris, which drives him into personal and political corruption and finally, assassination. Law hardly deserves all the blame for the film's failure. He nobly shares the ineptitude with the usually admirable Sean Penn, who seems totally miscast as a powerful, charismatic politician. Waving his short arms in the same graceless gestures whether recording his song, "Every Man a King," or speaking to a crowd, or orchestrating the movements of a sultry stripper, Penn looks constrained and uncomfortable throughout. His attempt at a Southern accent somehow strangles his diction, so that he swallows a good deal of his dialogue and never lets it escape. Though completely underused and limited to a few lines of dialogue (and even fewer gestures), James Gandolfini provides the only strong physical presence in the movie; his corpulence also reminds us of the burly Broderick Crawford, who won an Academy Award for his Willie Stark in 1949. Nobody, by the way, generates the fierceness and passion of Mercedes McCambridge as Willie's mistress --- Patricia Clarkson's version of the character seems merely exhausted. Beyond those defects, however, Steven Zaillian's script and direction retreat from the opportunity to construct a dynamic and vigorous narrative. He simply refuses to show exactly how Willie strays from his promises, instead presenting most of the major action off screen, so that Burden and Sadie Burke (Clarkson), like some badly imagined chorus, must talk about developments the audience is never allowed to see. Whether intentionally or not, the director edits out just about all the major thematic points and supplies no convincing reason for the tragedy of Willie Stark, a waste of a significant American novel and a classic Hollywood film. All the King's Men (PG-13), directed by Steven Zaillian, is now playing at Pittsford, Henrietta 18, Tinseltown, Greece Ridge 12, and Eastview 13.